In true NPH Family fashion, the six Seattle Institute students threw a Christmas party to share the season with their community of support in the Northwest. Inviting past volunteers, mentors, staff, homestays and friends, the Seattle students planned a night of fun, games, and a delicious menu featuring tamales and pupusas, both Latin American specialties. Generously hosted at the Martinez family home in West Seattle, the night began with the traditional singing of the Posadas, inviting all of theguests to reenact Mary and Joseph’s search for a place to rest in Bethlehem. From there, the students led rotating games and activities, from cookie decorating and pin the nose on Rudolf, to floating apple-eating competitions and lime-hop relay races. And it would not have been the same without the homemade Christmas photo booth! Everyone who gathered was able to see and feel the love, joy and generosity of the season that our NPH Family shares with us so well. Thank you to Darich, Darlyn, Ever, Farid, Maria and Yomara for preparing such a wonderful evening and sharing your traditions and Christmas spirit with us. August is a time when our NPH community steps back and reflects on the life of Father Wasson, our dear founder of NPH. The work he did, grounded in faith and a higher purpose, lives on today well after the day of his passing, August 16, 2006. Donna Egge, NPHI Mission Minister and Director of Family Services, shares words of gratitude and inspiration that comfort us as we remember Father Wasson and all that he stood for, and that we continue to work for today. As we come to the time of year when we remember Fr. Wasson intentionally, I can’t help but imagine just how proud he is of his pequeños and pequeñas and our global NPH family that continues to flourish today. His goals from over 40 years ago (click here to read more) align with the goals we have today: education, vocational training, encouraging potential, becoming productive members of the respective communities. This is what WE DO! And it is possible to reach these goals, because we commit to never losing sight of the deep faith that inspired Fr. Wasson and inspires us today. This hope that rises from our faith, pushes us constantly to be the family that our children desperately need. It is through living and experiencing the founding principles from Fr. Wasson, of Sharing, deep felt Security, hard Work, and Responsibility that allows for the transformation and reaching of goals by our children and youth. I didn’t have the privilege of knowing Fr. Wasson well. I didn’t spend years growing up with him as my mentor. But I AM a dreamer! I imagine a world where the cycle of poverty can be broken. I AM inspired by a deep faith, by things that are mysterious, transformations that can’t be readily explained. I can see the feeling of belonging in the eyes of our children. And this I know to be the gift of Fr. Wasson for us today. To LIVE this dream into reality. We are each called to remember, this month, our dear founder and in his name commit to work hard and to share what we have and what we know and what we believe, to provide security of love and education and the promise of a better future, and to be responsible together in our responses to the needs of our NPH family and the extended world in which both we and our children live. May everyone today take a moment and give thanks to God for the presence of Fr. Wasson in our lives. May his dedication to his faith and his vision inspire us deeply in the coming year. Our youth at NPH, after achieving their independence and graduating from university or another program, become the older brothers and sisters in our family, also known as ‘hermanos mayores’. The paths that hermanos mayores decide to take are varied and unique. Many pursue their career outside of NPH, while others feel called to come back. They provide their skills and expertise to the home as they become wonderful role models to the little ones. Jader Rayo is one of our hermanos mayores who chose to dedicate his career to NPH and is passionate about supporting the kids. Arriving at the age of 13 to NPH Nicaragua, he grew up in the home, continued his studies and graduated from university, and then returned to work at NPH full time. Even while he was studying at the university, he continued to stay involved in the lives of his younger brothers and sisters and always has taken a great interest in their wellbeing and preparedness for life after NPH. Since then, Jader has worked in multiple roles with NPH, and currently coordinates the University and Hermano Mayor program at NPH Nicaragua. He has been part of the staff for a total of nine years. He shares with us his experience, both growing up at NPH and working as a staff member. Looking back on your childhood at NPH, how did it impact the person you are today? What NPH did for me was definitely a radical change, I feel like it was NPH that gave direction to my life. I hadn’t found meaning and purpose, but thanks to God I learned that every one of us in this life has just that. Back then, I didn’t think that I would finish primary school let alone university, feel competent in society, and be able to support my small family and NPH as I do now. What do you want for the children at NPH? I would like to continue being an instrument to help the children achieve their goals as they grow up. I would like to see them when they are older with values, and as professionals, and that they keep that family spirit alive that we have inherited here at Nuestros Pequeños Hermanos. What inspired you to work for NPH? What inspires you currently? Dedicated people with Father Wasson’s vision inspired me to begin working at NPH. Now it’s the effort that I see from so many kids wanting to move forward in their lives, and seeing the service they do for others. What does NPH mean to you? NPH is something very special, it’s a blessing for my little family and I, and for my brothers and sisters who I have grown up with. 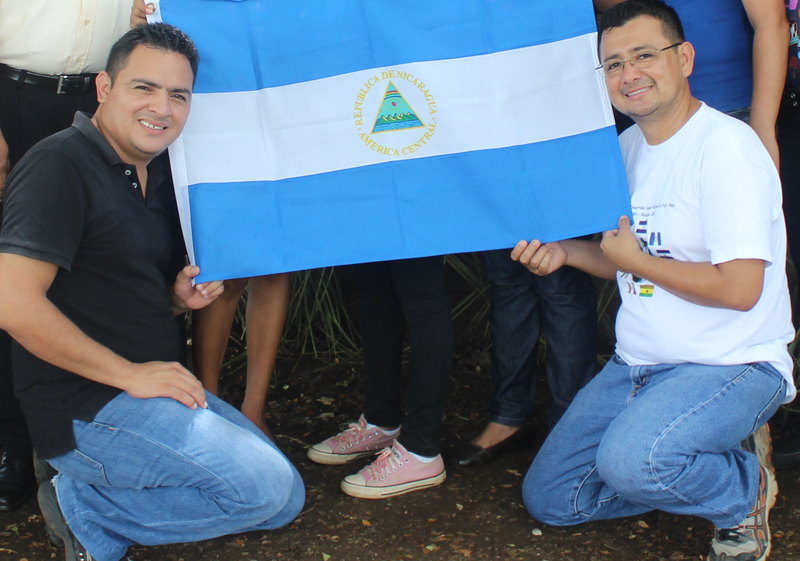 Jader (left) with Mauricio (right) who works at NPH Nicaragua and is also a hermano mayor.